The Jan Andolan Party missed the bus, so did Trinamul as both the parties set the classic example of how a failure to reach a consensus can help a third political party. Over the past three months or so, Kalimpong had topped on the list of priorities of Gorkha Janmukti Morcha chief Bimal Gurung because of the emergence of the JAP as a political force to be reckoned with here, the state's decision to form several development boards of the hill communities and most importantly, announcement of Kalimpong as a separate district. As the two parties posed challenge to the Morcha's supremacy, Gurung camped in Kalimpong for several days, and pledged to retain the civic body, where his party had won uncontested in all 23 seats in 2011. Today, he had reasons to cheer as the Morcha bagged 19 of 23 seats - seven more than the magic figure of 12. The reason was simple - division of anti-Morcha votes between Trinamul and the JAP, the two forces which had joined hands to take on the dominant hill party in the 2016 Assembly polls. "Ahead of the Assembly polls in 2016 and even after, JAP and Trinamul leaders had excellent relations. Harka Bahadur Chhetri (the JAP chief) contested from Kalimpong Assembly seat and Trinamul did not field a candidate. After Harka lost the polls, the Trinamul chief inducted him into North Bengal Development Council as the vice-chairman," an observer said. However, as Trinamul started making inroads into the hills and got workers of other parties on board - including those from the JAP - Chhetri sprung to protest. "This move by some of the hill leaders of our party led to cracks in the relationship. Although our state leaders and those from Siliguri tried to address Harka's grievances, the relationship deteriorated fast and the JAP announced that his party would go it alone in the civic polls," said a Trinamul leader in Siliguri. Sources in the JAP said Chhetri was confident of pulling it alone as the JAP was ahead of the Morcha in 19 of the 23 wards, if the results of the Assembly elections were considered. "What JAP leaders failed to realise was that it included votes of Trinamul supporters. Also, they should have taken into account the fact that with the announcement of development boards and the new district, the votes of Trinamul were likely to increase in the civic polls. On the other hand, Trinamul should not have undermined the support base of the JAP. The results today indicate that an alliance would have left the Morcha in a sticky wicket," an analyst said. As results came out, it was revealed that the Morcha got 10,872 votes whereas the votes of the JAP and Trinamul together were 11,166. Despite the division of anti-Morcha votes, the JAP and Trinamul managed to secure two wards each. A closer look at the ward-wise tally reveals that the Morcha was behind in nine more wards (wards 2, 3, 6, 8, 11, 14, 20, 21 and 22). Trinamul leaders in the hills, when referred to the data, admitted that a "more conciliatory approach" was necessary to avoid the "break-up" with the JAP. They explained how the party gained by joining hands with the GNLF in Mirik. "It was necessary to hold talks earlier and simultaneously prevent the local leaders from poaching the JAP's supporters. Like the GNLF, we could have shared seats and offered more seats to the JAP," a leader based in Kurseong said. While the JAP is fundamentally in favour of a separate state by bifurcating Bengal, Trinamul is opposed to any further division of the state. Chhetri, however, dismissed suggestions that the JAP-Trinamul alliance would have fared better. "Maybe we might have done even worse than what we achieved today. It takes such a long time for a good thought to translate into action. We believe we have come up with a good thought, and if we stick to it and work accordingly, we will succeed," he said. Trinamul leaders, who were simultaneously eyeing Kalimpong along with Mirik, said they need to work further to build support base. "In Mirik, the alliance worked and we could secure the municipality. 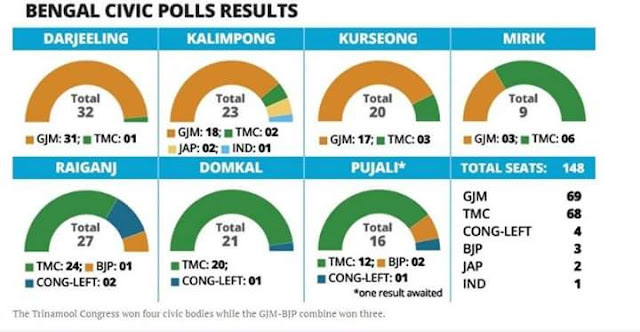 We were expecting similar results in Kalimpong but due to a three-way contest, we could secure only two seats," Rajen Mukhia, the president of Hill Trinamul Congress, said.